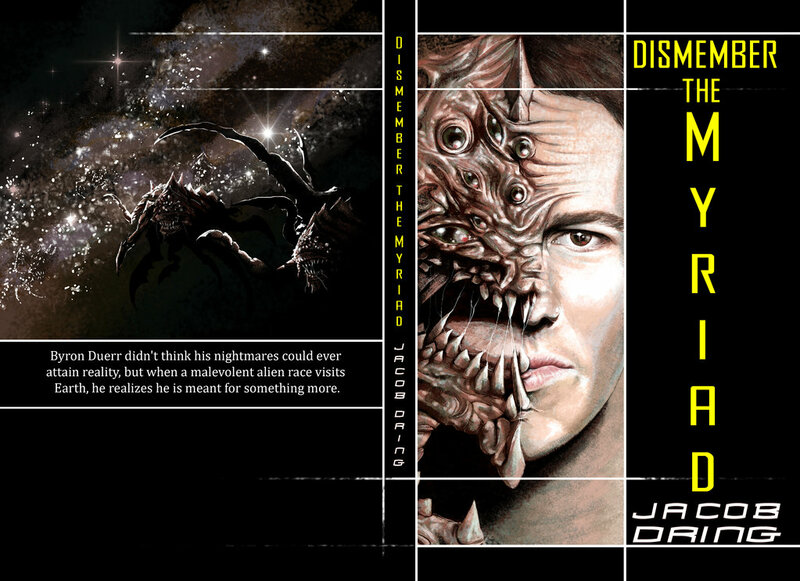 Full wrap cover I created for Jacob Russell Dring’s latest dark sci-fi ‘Dismember the Myriad’. Available from Amazon for Kindle and as paperback. Byron Duerr didn’t think his nightmares could ever attain reality, but when a malevolent alien race visits Earth, he realizes he is meant for something more. Very nice – love the contrast between the intense stare of the protagonist and the hideously alien appearance of the monster. There’s something almost sorrowful about that one “human” eye in it’s otherwise utterly inhuman face, like it knows what its going to do to you and it pities you for it. Great to see your process as well, always interesting to see how someone works through an idea.